We are psyched to have longtime favorite artist Ron Knight back with us as our first guest artist in the new gallery space. Ron has exhibited twice before at Mastroianni Arts, once back in 2009 where we first became familiar with his themes of recycled and re-imagined iconography, and again in 2011 with an amazing installation exploring themes of the road and beyond. 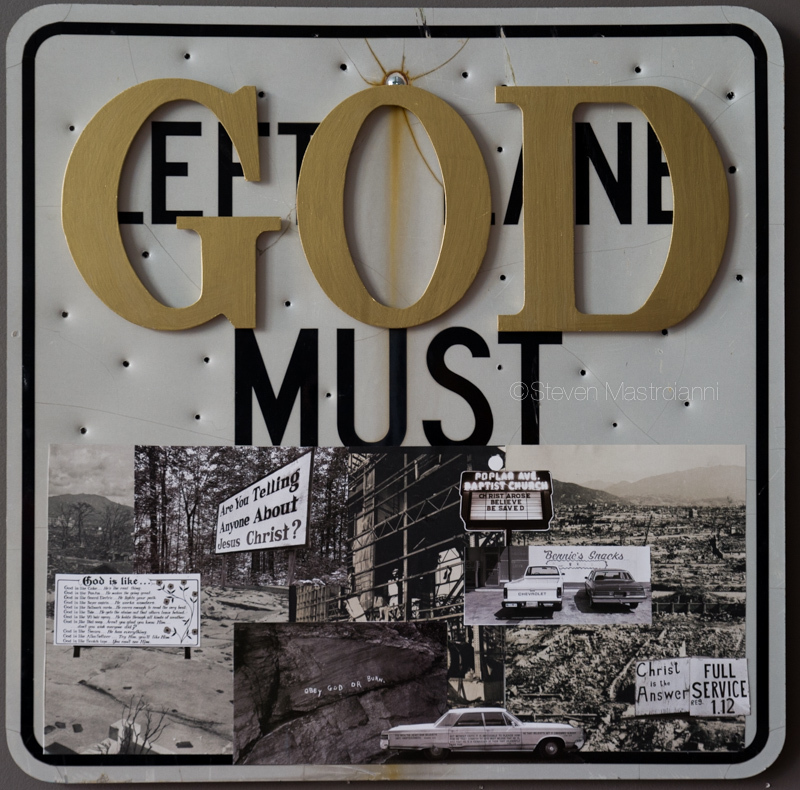 His new exhibition, "Signs From God", continues his reworking of icons and the familiar roadside themes of his previous work, condensed into actual reconstructed and manipulated road signs.The exhibit will open the May Tremont Artwalk on Friday, May 9, and continue through the June 13th Artwalk. Ron Knight Jr. is an outsider artist. Self taught, his chosen mediums are sculpture, mixed media, painting, drawing, and performance art for over 40 years. Ron is currently a Construction Superintendent working in Columbus. His art has been shown at Studio 83 in Columbus, at Spaces Gallery in Cleveland, as well as Mastroianni Arts and Jefferson Studio in Tremont, and at Art 101 Gallery in Medina, Ohio.